at the 2011 Individual & Ensemble Competition. 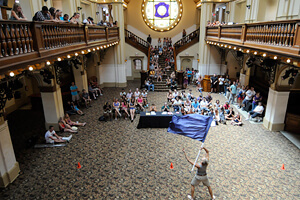 A color guard member performs inside of Sunset Station. The event will take place this coming Sunday at historic Sunset Station (1174 E. Commerce, San Antonio, TX 78205), located just a few blocks from the Alamodome. The event will begin at 10 a.m. (CT) and run approximately three and a half hours. "What's great about Sunset Station is that most of the performers who are returning will be very familiar with the location," Mavroudis said. "It's convenient and right in the heart of downtown. We're really excited to bring the event back there." I&E will take place the day following the DCI Southwestern Championship at the Alamodome. Many corps treat this as a day off for members, performing in the morning or early afternoon and then having the day off to enjoy the River Walk or take care of laundry. Open Class corps members will once again have their own I&E Competition during the week of the World Championships in Indianapolis, this year on Wednesday, Aug. 8 at the Indiana Convention Center. Learn more information about the 2012 World Class I&E Competition. View a photo gallery from the 2011 I&E Competition. View the complete I&E performance schedule.